We investigate a class of variational problems that incorporate in some sense curvature information of the level lines. The functionals we consider incorporate metrics defined on the orientations of pairs of line segments that meet in the vertices of the level lines. We discuss two particular instances: One instance that minimizes the total number of vertices of the level lines and another instance that minimizes the total sum of the absolute exterior angles between the line segments. In case of smooth level lines, the latter corresponds to the total absolute curvature. We show that these problems can be solved approximately by means of a tractable convex relaxation in higher dimensions. 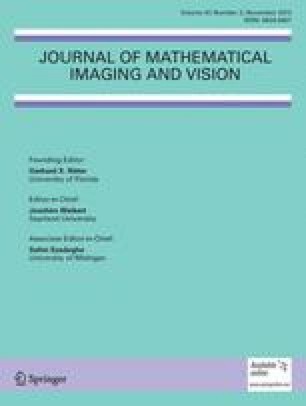 In our numerical experiments we present preliminary results for image segmentation, image denoising and image inpainting. We thank Antonin Chambolle and Stefan Heber for fruitful discussions. The first and the third author acknowledge support from the special research grant SFB F32 “Mathematical Optimization and Applications in Biomedical Sciences” of the Austrian Science Fund (FWF) and the second author acknowledges support from the Austrian Science Fund (FWF) under the grant P22492-N23.